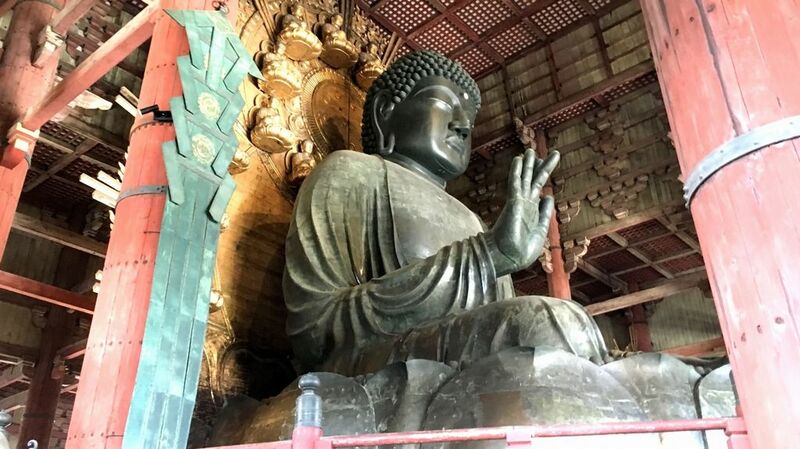 Todai-ji Temple houses the largest metal statue of the Buddha in the world. Todai-ji Temple, one of Japan’s most famous and historically significant temples and a landmark of Nara, was established in 752 as the head temple of all provincial Buddhist temples of Japan. Passing through the Nandaimon (the main gate),a large wooden gate watched over by two fierce looking statues, you can see the big roofs of Daibutsuden (The Great Buddha Hall). The 57-meter wide and 47.5-meter high Daibutsuden is the largest wooden building in the world. It also represents the Tenpyo culture in terms of its scale. This massive building houses the Great Buddha, designated a National Treasure. The Great Buddha is roughly 15-meter tall, and is the largest metal statue of the Buddha in the world. Several smaller Buddhist statues are also on display in the Daibutsuden Hall. Can you squeeze through this hole? Inside the Daibutsuden, there is a pillar with a hole in its base that is the same size as the Daibutsu’s nostril. It is believed that those who can squeeze through this hole will be granted enlightenment in their next life. At the north of the temple is Shoso-in (Imperial Repository), the end of the Silk-Road. The Shosoin is a large storehouse constructed in the 8th century. It’s used to store the treasures of Todaiji Temple and the Imperial Family. In the west, there is Kaidan-in Temple, which houses statues of Shitenno (the Four heavenly kings, a National Treasure), masterpieces of Tenpyo Era sculpture.